I'll be posting my other works here too just to keep from clogging up TS4Studio forums lol. In the Sims world I do recolors/retextures, pose making and dabble in modding. I can be found @ Simposeum-S-4 on Tumblr & Creator Studio. 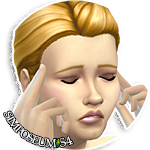 You can find me in-game on TS4 Gallery under SimposeumS4.